Where can I stream the Tour Championship? Sky Sports subscribers can stream the tournament online via Sky Go. Where is the Tour Championship? East Lake Golf Club, Atlanta, Georgia, U.S.
What is the format of the Tour Championship? The top 30-ranked players in the FedEx Cup standings have made it through to the season-ending finale. The top five-ranked players in the standings have it all in their own hands; a win this week sees them claim the FedEx trophy and the $10,000,000 bonus prize. The Tour Championship once again returns to East Lake G.C., the host venue since the introduction of the FedEx Cup playoffs. Over the last 11 editions, eight of the winners have gone on to lift the FedEx crown. Keegan Bradley recorded his first win since 2012 at the BMW Championship by beating the now world number one Justin Rose and moving up a mammoth 46 places from 52nd to sixth to give himself a real chance of claiming the FedEx Cup. Another win this week would very likely see him gain the most unlikely of crowns, which is a very possibility if DeChambeau does not contend. Last year’s Tour Championship winner Xander Schauffele climbed 23 places into 18th to get himself back at East Lake to defend his title with a T3 finish. Without a win this season but many close calls, he could be hitting form at just the right time to earn back-to-back championships. Rory McIlroy’s form continues to progress with a fifth-place finish that moved him up seven spots into 17th. With only one win so far after a lacklustre season, McIlroy’s game is suited to the long course and as a winner just two years ago, has a great opportunity to end his season on a high. Billy Horschel’s impressive playoff form continues with a T3 finish moving him up a further six places inside the top 10 (ninth). If results go his way and the top three-ranked players do not contend this week, a win for the 2014 champion would see another come-from-behind FedEx title. The top five-ranked players heading into the Tour Championship each have their destiny in their own hands with a win resulting in the FedEx crown. 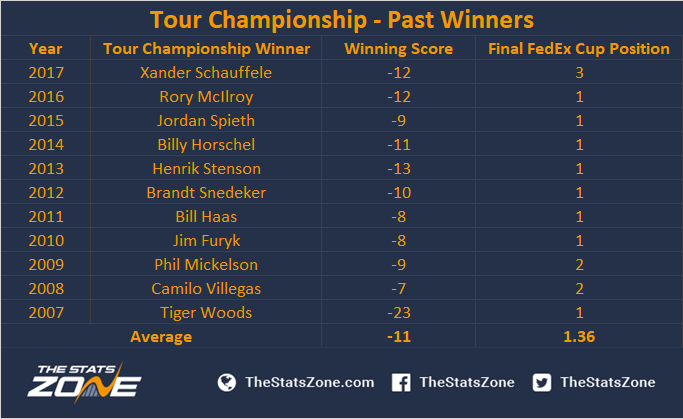 Let’s take a look at how results need to go this week for each player to claim the FedEx Cup title. Bryson DeChambeau has been the standout player during the playoffs with two wins giving him a healthy lead, meaning a finish inside the top six is highly likely to give him the cup. Mathematically, a finish as low as T29 could still give him the crown, and with the form he is in at present, the leading player this year is likely to stay on top. The new world number one Justin Rose was somewhat unlucky at the BMW Championship and it would arguably be a fitting end to the season seeing the world's best player - and without doubt most consistent over the last 12 months - claim the title. A top-three finish could get it done and if results go his way, finishing as low as ninth will see him over the line. Tony Finau is the only player inside the top nine without a win this season but has recorded the joint highest number of top-ten finishes (11). After making the USA Ryder Cup team as the final pick, the win would be the perfect timing. He can still claim the crown if results go his way with a T2 finish but cannot finish lower than in a two-way tie for third. Dustin Johnson’s second half of the season has been somewhat quiet but three wins and a joint high of 11 top-ten finishes show his level. A second-place finish could still see him win the cup but mathematically, the worst result he can achieve and still win is in a three-way tie for second. Expect him to be going all out for the win this week. Reigning FedEx Cup champion Justin Thomas makes up the top five but he needs a minimum of a second-place finish and for results to go his way. With a joint high of three wins this season, Thomas won’t be giving back his crown quietly – expect him to have a big part to play this week.